Here is a list of things We can do for me. If you hire me. Intelligent Telecoms Routing credit card processing solution provides organisations with an easy to deploy, fully PCI DSS compliant way to take payment card details from customers, leveraging the Intelligent Telecoms Routing cloud platform and without the need to make changes to existing systems and processes. The system features separate entry of each secure element by the customer using the telephone keypad, with the operator introducing each element. This allows the operator to coach the customer through the process whilst secure data is neither call-recorded nor revealed to the operator. 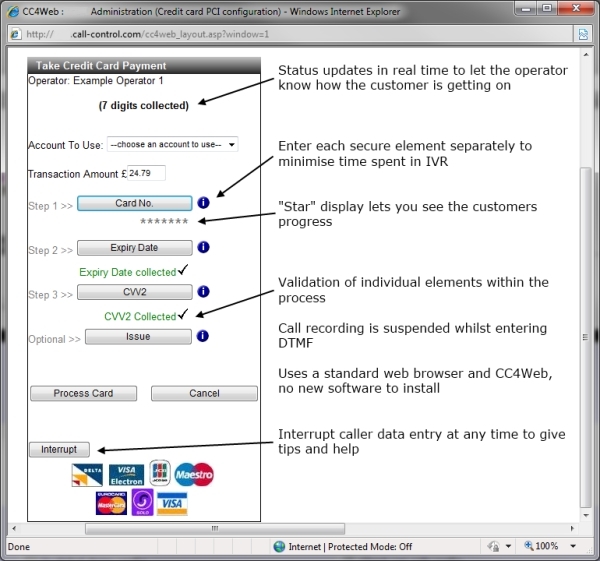 The operator can trigger entry and processing of credit card data at any point during the call whilst logged on. The ITR PCI solution prevents unauthorised access by contact centre staff to sensitive card data. This removes the need to operate a ‘clean room’ policy where paper, pens and mobile phones are prohibited from the agent’s desk. What is unique about The Intelligent Telecoms Routing solution is that while sensitive information is masked from the agent, the conversation between agent and customer is able to continue, ensuring that both control and the customer experience is retained during the payment process. Operator can trigger entry of credit card data at any point during the call. Sensitive credit card data is not stored after the transaction has been completed. No credit card data is transmitted insecurely across networks. Each data element (card number, expiry, cvv2) is entered separately to allow the operator to coach the customer. Call recording is suspended whilst data entry is happening – DTMF signals are not recorded. Interactive entry minimises customer dropout. Real-time feedback to the operator on data entry progress. Re-enter any element (card number, expiry, cvv2) multiple times without affecting the others. Operator can talk to the customer whilst the online transaction is being performed, minimising “dead” time. Control panel runs in a standard web browser – no special software required. Our customers will have access to view the list of transactions at any time through the call log. Additional charges or refunds can be invoked against each transaction at a later date through a series of buttons in the call log.